Is body mass index (BMI) still the best measure of body fat? Q. Over the last few years I've read that BMI may not be the best way of determining whether a person is overweight. Is that true? A. BMI (your weight in kilograms divided by the square of your height in meters) is a pretty reliable way to determine whether you have too much body fat. That said, BMI is not a perfect measure because it does not directly assess body fat. Muscle and bone are denser than fat, so BMI can overestimate body fat in athletes with high bone density and muscle mass or underestimate it in older people who have low bone density and muscle mass. Because direct measurements of body fat require special equipment and are expensive, BMI is considered a reasonable alternative for identifying people who are overweight or obese, placing them at higher risk for medical conditions such as diabetes, high blood pressure, high cholesterol, heart disease, stroke, sleep apnea, and certain cancers. A BMI of 18.5 to 24.9 is considered normal; 25 through 29.9 indicates overweight; and 30 or more, obesity. 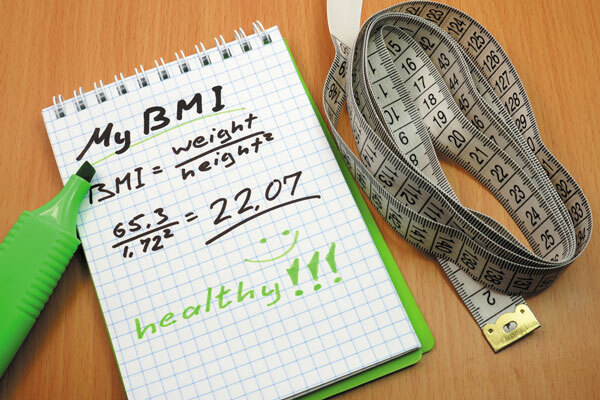 You don't need to see a doctor to assess your BMI. You'll find a BMI calculator on the Harvard Health Publishing website at www.health.harvard.edu/BMI. All you have to do is type in your current height in feet and inches and your weight in pounds, and the calculator will do the math for you. The hard work may come if you need to make lifestyle changes to lower your BMI.